Do you have any relatives who served as officers in the New Zealand Expeditionary Force (NZEF) during World War I? 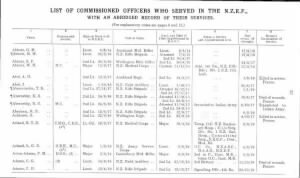 Learn more about them in Fold3’s New Zealand Expeditionary Force Records. This title is a facsimile reprint of Lt. Colonel John Studholme’s book New Zealand Expeditionary Force Record of Personal Service During the War, published in 1928. Though the book is not technically an official New Zealand government publication, it is based on official records and endorsed by the New Zealand Defence Department, making it official in all but name. Do you have any relatives who served with the NZEF? Tell us about them! Or get started searching or browsing Fold3’s New Zealand Expeditionary Force Records.